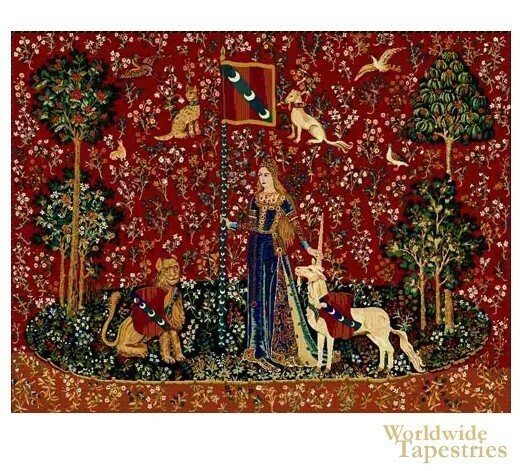 The sense of touch is celebrated here in this wall tapestry from the Lady and the Unicorn series of tapestries. Here the lady is touching the horn of the unicorn bearing a shield of the symbol of the La Viste family. Her other hand is holding the pennant of the La Viste family crest. The background is a flurry of flowers and animals spread through the scene such as a leopard, pheasant and rabbit. The lion is also seen in this scene guarding the lady. This unicorn tapestry Touch (Le Toucher) I is backed with lining and tunnel for easy hanging.